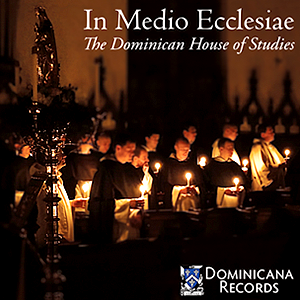 HE DOMINICAN HOUSE of Studies schola has just released its first album, In Medio Ecclesiae, under the aegis of the newly founded Dominicana Records. Through the direction of Fr. James Moore, O.P., the student choir has been working for more than eighteen months to produce a recording of the finest-quality liturgical music from different eras and traditions of the Church. The album contains fifteen pieces, with seven works from the various liturgical seasons, three timeless hymns of rejoicing, three in honor of specific saints, and two in praise of the Blessed Virgin Mary. The album is available now for download at the following website; CD purchase coming soon. The repertoire of In Medio Ecclesiae includes Dominican chant, Renaissance polyphony, Eastern chant, and new compositions and arrangements by Fr. James Moore, O.P. and Br. Vincent Ferrer Bagan, O.P. The pieces are in both Latin and English, and borrow from the Italian, Spanish, English, Polish, and American musical traditions of various eras. Dominicans know, of course, that a work of art always shows the hand of the artist, and this collection is no different. The album includes pieces dear to the heart of our liturgical tradition, from a polyphonic setting of St. Thomas Aquinas’ O sacrum convivium to the chant for St. Dominic’s feast day, In Medio Ecclesiae, in addition to a variety of other pieces both simple and complex. Created and produced by the talents of our brothers and professionally mastered, the album is an offering from our fraternal life to the life of the world. We hope you enjoyed this guest article by Br. Gabriel Torretta, O.P.